on the lens surface in its polishing process. just follow the procedure in below. Make a solution of Water:SSO =100:1, and put it into a bottle. Put SSO into the tank for water circulation. SSO helps to prevent the scratches on the surrface of lens during in polishing. The concentration of SSO should be 10cc for 10 lit. tank, and 20cc for 20 lit. tank. Polish the lens with water flowing from the tank. Rinse the lens with water. 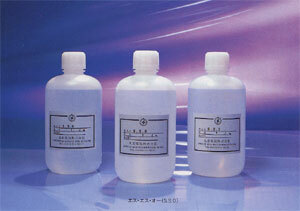 Drop 20~30cc SSO solution prepared in polyethylene bottle on the surface of lens to prevent solarization on lens surface. Rinse the lens with water. after l~2 min. of dropping the SSO solution on the lens surface, and then clean it, with cloth.